This dual action formulation effectively lightens your skin tone while deep-moisturizing it. The presense of vitamin-C-Rich Mandarins externally lightens the complexion. On the other hand, the silk extracts works from the inside, by controlling the production of skin-darkening pigment, melanin. Together they grant you softer, smoother and fairer complexion. Mandarin: Lightens skin and maintain moisture balance. Silk Extract: Controls Melanin production. 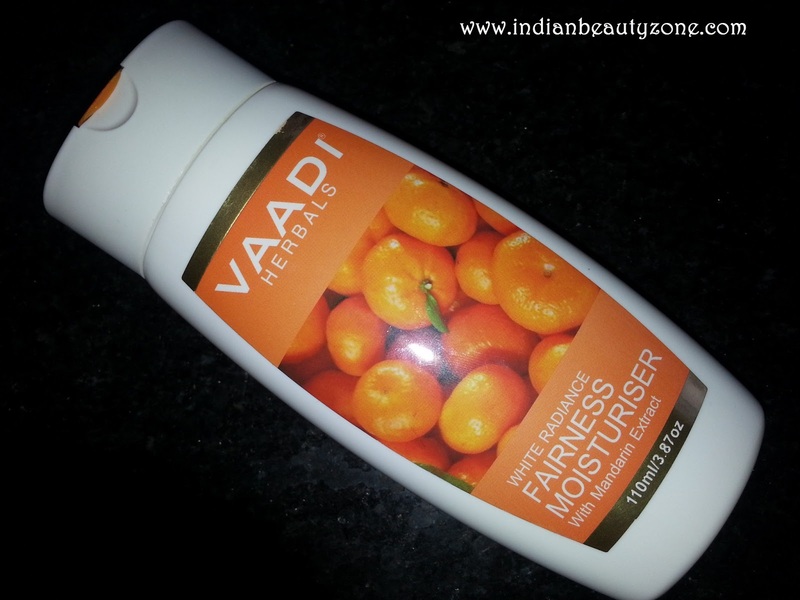 This Vaadi Herbals White Radiance Fairness Moisturiser comes in a white colour sturdy plastic pack with Orange colour flip cap open lid. This package is very cute and handy, travel friendly. The cream is milky white and thick in texture with a pleasant fruity fragrance. The cream is thick in texture, so I was thinking to try this on my face. Finally I applied this cream during night time in the chin part only to test. In the morning, Thank God I don't have any allergy or break outs. So, in the day time I have started to apply this cream on my face after bath. I use to apply this twice a day. A very little amount is enough for the entire face and neck. For blending the cream, I need to do extra 2 to 3 strokes then the other creams. But, after the skin absorbed the cream face looks bright with mild glow. This is matte look moisturizer, though it is not claiming to do. It gives a subtle glow to my cheeks. I didn't expect the whitening claiming of this cream. Still this cream enhance my natural skin colour. It makes my skin soft and smooth. I love to smell this cream very much. After few hours my T-zone Became shiny, it will happens if I apply other creams too. This cream improving my skin's natural colour and texture slowly. I am happy with this cream and it is a good, affordable daily use moisturizer with goodness of herbal extracts. Affordable for this large quantity. This creams will last long for maximum 1 and half month for sure. Small amount of cream is enough for the entire face and neck. This cream imports Skin's natural colour and texure. This cream makes skin smooth and soft. This cream gives a subtle glow. No oily feeling and it is non greasy formula. Herbal moisturizing cream, which is less risk of side effects. Need extra strokes to blend, as the cream is thick. Vaadi Herbals White Radiance Fairness Moisturiser cream is a good moisturising cream for daily use for all skin types.Do try this product once Beauties, you will like it. PS:Product sent by PR for Review purpose, My Review is honest as always. Apply it all over the face n neck after drying gently rub it by using warm water, after that wash it off by cold water. This is for all skin type and if you have allergic with Turmeric or lemon you can avoid it. Nice review Rads :D I might try it! This looks effective...will try it out. I have this and I agree to most of the points but I do not use it due to very strong smell and thick texture. I always do fear of getting whiteheads so avoid..
Hope it is an effective product Radha! Thanks for the useful review. Will try it now. Hey Radha is everything Okay???? you mentioned you were feeling sick......i hope you are well now. Take care of yourself. I was not in Pune for a while and for that reason could catch up with your blog, however your review has solved my confusion as i was a little skeptical about purchasing this product but now the confusion is finally over! Thanks for a wonderful review! Good to know you r doing fine and I am doing great thanks. I will surely try this lotion. So Radha where r u from? Herbal Products are the best remedy to seek development as they are free form any kind of side effects and moreover they provide a slow and steady progress which is ideal for the human body. 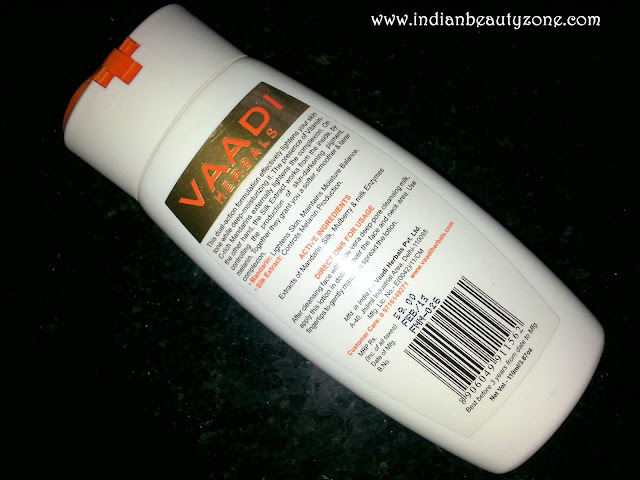 Vaadi Herbals White Radiance Fairness Moisturiser is really good.